Around 1.5 million Ukrainians in the east of the country have been uprooted by war. People who had homes and jobs find themselves crammed into a small room or two and are largely dependent on charity. Massive protests in Ukraine at the end of 2013 evolved into full-scale conflict in the east of the country in 2014. The protests were against Ukraine’s president’s decision to strengthen ties with Russia and move further away with the possibility of integration into the European Union. Fourteen months later, following heavy fighting between pro-Russian separatist and Ukrainian government forces, millions of civilians have been caught in the line of fire. More than 5,400 people have been killed, over 900,000 people have fled their homes to other parts of Ukraine and at least 600,000 have fled to other countries. In June 2014, as displacement in the east reached a peak, Caritas Ukraine and Catholic Relief Services (CRS – a US member of Caritas) began jointly distributing emergency food, water and living supplies, supported by other Caritas member organisations. As winter neared they provided helped 4,100 displaced and host families in the provinces of Kharkiv, Dnetropetrovsk, Donetsk and Zaporizhia with grants for rent and items such as blankets and wood to prepare them for the cold winter. 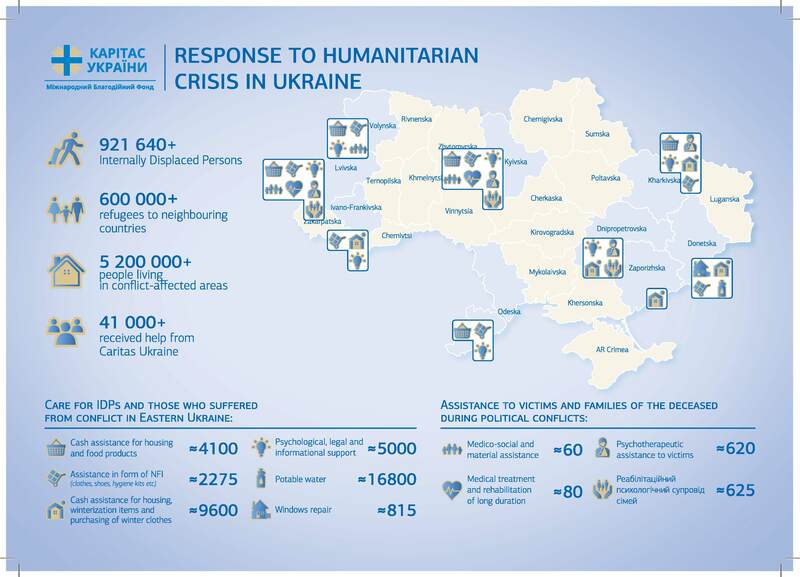 Caritas Ukraine has so far helped over 40,000 people with the support of other Caritas organisations. Caritas Poland helped transport 150 tonnes of aid including food, hygiene items, warm clothes and heaters, bed frames and cleaning products, aimed at helping 5000 people in December. Caritas has been giving counselling and legal assistance to those displaced from their homes. It provided water to over 15,000 people after supplies were cut off because of the conflict. “IDPs face enormous range of problems: they left their homes, jobs, schools, without possibility to take their clothes and other household things. Therefore, we are trying to boost our capacity to reach a greater number of victims, especially the most vulnerable,” says Andrij. The people who’ve been affected by the war desperately need food packages, hygiene items, medicines, clothes and shoes. But they also need help paying rent, access to schooling for children and jobs. In a message to the European Union in January, Andrij highlighted the effects of the conflict on Ukrainians. He cited a lack of drinking water and fresh food, an increase in diseases such as tuberculosis and the environmental damage caused by the conflict. “EU member states are making great efforts to end the conflict. Helping the victims must be part of this objective. Therefore, a proposal from the Foreign Affairs Council to increase Europe’s humanitarian aid to Ukraine would be the most sensible thing to do,” he said. Caritas Ukraine have been accompanying those affected by the conflict, ever since the protests in 2013. It provided medical help to those injured and who lost limbs in the protests and continues to do so. It has also been providing counselling and psychotherapy to the victims of the protests and to the families of those who died and to those traumatised by the events. 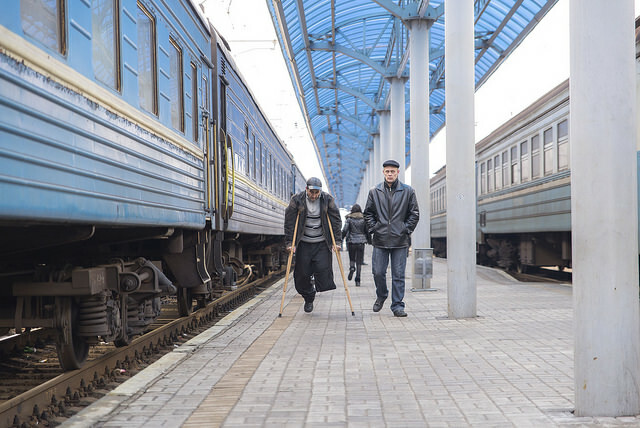 With no peaceful solution on the horizon yet and the displacement of so many people whose needs are great, Caritas is preparing to ramp up its efforts to give long-term help to the vulnerable people in Ukraine.